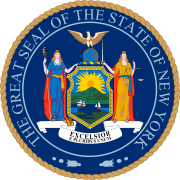 The 1980 United States Senate election in New York was held on November 4, 1980. Incumbent Republican U.S. Senator Jacob Javits was defeated in the primary, and Republican Al D'Amato won the three-way election. Javits's refusal to adjust politically to the rightward movement of his party as well as his 1979 diagnosis with amyotrophic lateral sclerosis (also known as Lou Gehrig's Disease) led to a primary challenge. Javits was defeated in the primary by Hempstead Presiding Supervisor Al D'Amato on September 9. D'Amato, also running on the Conservative line, proceeded to defeat Democratic U.S. Representative Elizabeth Holtzman and Javits, who ran on the Liberal Party ticket. In the traditionally liberal state of New York, Javits split the Democratic vote with Holtzman to give D'Amato a close victory. ^ "Syracuse Mayoral Primary Results - 9wsyr.com". Archived from the original on 2011-07-19. Retrieved 2013-06-26. ^ Abramowitz, Alan; Segal, Jeffrey Allan (January 1, 1992). Senate Elections. University of Michigan Press. ISBN 0472081926. This New York elections-related article is a stub. You can help Wikipedia by expanding it. This page was last edited on 22 March 2019, at 03:29 (UTC).